Text © Copyright August 2017, Julian Paren; licensed for re-use under a Creative Commons Licence. I am not alone in visiting Colonsay repeatedly. The Editor of Scottish Islands Explorer has told me that Colonsay has the highest number of return visitors for any Scottish island. You may be able to do Skye in one trip, but Colonsay, promoted as the Jewel of the Hebrides, draws you back time and time again. My first family visit to Colonsay was in 1992 and my most recent, the eighth, was early this summer. My last two visits to Colonsay occurred after I joined Geograph, and only on my visit this year did I own a digital camera. The fort is on the top of the knoll above the sea. There are two people on the beach. Most people approach Colonsay by sea. A ferry journey of a little over two hours from Oban covers the 36 miles in usually quiet water. Sheltered by Mull for the first hour and then a stretch of water open to the west before reaching the shelter of Colonsay and landfall at Scalascaig. A beautiful evening to sail to Oban. On Wednesdays and Saturdays you can arrive at Colonsay by a smaller ferry, MV Hebridean Isles, from Islay and Kennacraig and have a day trip to Colonsay. 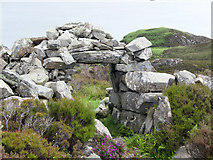 Otherwise visiting Colonsay requires accommodation on the island. Colonsay is 10 miles long and 2 miles wide. It lies south of Mull, west of Jura and north of Islay. It has a population of 135 and eight miles of road. Visitors will find a car useful but Colonsay is bicycle-sized! Bicycles are a very popular way of exploring Colonsay. Colonsay’s highest hill, Carnan Eoin, is 143 m high, but of Munro stature. A striated rock ridge backed by a fine cairn with two children on the summit. The final route to the top of Carnan Eoin lies around the left hand skyline. This is the highest point of Colonsay. My family has the beach to itself. The whole island is grand scenery on a small scale. Port Ban from the cliffs of Beinn Bhreac. The lower ground at the seashore beneath the cliffs is called Aoneadh nan Muc, or Pigs Paradise in English. The island has been owned by Lord Strathcona and Mount Royal for over 100 years and the family live in style at Colonsay House. The central part of the house was first built by the McNeill family in 1722. It is a medium-sized Georgian country house. Assumed to have been built on the site of an earlier Abbey, it is the earliest Classical House in Argyll. It has been extended twice in between 1722 and the early 20th century. Since 1904 the house has been the property of the island's owners. The island has good agricultural land and the island is run as two farms. Seen from the rougher ground beyond the enclosure of fields. There are a number of properties available for holiday lets, including estate cottages, a Backpackers hostel with WiFi, apartments in Colonsay House and some large farmhouses. 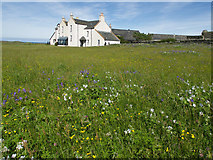 Both Baleromindubh Farm and Baleromindubh Cottage may be rented for holiday lets from the Colonsay Estate. The cottage is the nearer building. Both properties provide good views over the sea to Jura. 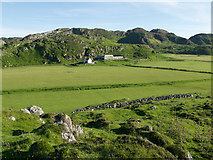 The estate owns The Colonsay - the island’s hotel. The Colonsay Hotel in 1994 was in private hands, but now owned by the Colonsay Estate it has been rebranded as The Colonsay. I give the new title to the hotel depicted in an old photograph. Motor homes and caravans are not allowed entry to the island. I have always been amazed that the cars that leave the ferry in Scalascaig just seem to vanish, because the natural places to park a car when exploring the island are seldom busy. The best weather is in the spring, and in May Colonsay shares with Tiree the accolade of being one of the sunniest places in the UK. There are no midges in the spring, and they have proved to be no trouble in the summer. Perhaps this is the most beautiful corner of Colonsay. It comes into its own in a northerly wind when the dunes can provide effective perfect wind protection. The Paps of Jura dominate the skyline eastwards. Colonsay has one of the finest beaches in Scotland, Kiloran Bay (recognised in Peter Irvine’s Scotland the Best), yet there are other dramatic beaches that reward the walk to reach them. White rippled sand that is a pleasure to walk on. The island is managed to conserve the habitat favouring corncrakes and choughs and the native black bee, so wildflower meadows are common and the machair can be a riot of colour. The Machrins machair is a golf course for devotees. Just what the Colonsay bees use for their wonderful honey. £11 a jar. The joys of this course are delightfully explained in Link . "The greens are mown and rolled during the season by local golfers, with some help from the sheep and some hindrance from the rabbits. In the winter, they are joined by the cattle of nearby Machrins Farm. As a consequence, you may have the unusual task of having to clear some livestock from your line of fire before playing your shot. Fear not, though: local rules allow preferred lies on all fairways and a free drop for balls disappearing into rabbit-holes or taken by the ravens. More good news: there are no bunkers! In keeping with the “primeval golf” theme, however, you will come across the occasional sheep-scrape in the sandy ground, which some believe to be the origin of the modern bunker." Colonsay and Oronsay boast that its outstanding natural scenery is rivalled only by the wealth and diversity of its flora and fauna and that its archaeological sites are of international importance. This Iron Age fort occupies the top of a rocky knoll situated in an area of rough moorland. It has been suggested that the visible structure is a reconstruction. Oronsay is a tidal island separated from Colonsay by The Strand, a mile of puddled sand at low water in which oysters are profitably farmed. The Prior of Oronsay provided a sanctuary for all those who were fleeing persecution. The cross marked the limit of the Prior's realm and is still intact at a midpoint of the Strand. The low walls in the bay were a failed attempt to cultivate native oysters in the early 20th century. According to John de Vere Loder in his book Colonsay and Oronsay in the Isles of Argyll published in 1935, "Attempts were made about 1910 to start an oyster bed at Luba na Eisearan (Oyster Pool, Garvard), but were defeated by the strength of the tides". It is interesting to realise how well the structures have survived despite the tidal strength. The Paps of Jura are visible on the skyline. Oronsay is managed by the RSPB as a bird sanctuary and conservation for the corncrake is the foremost objective. Located in front of the rather fine Oronsay House. The meadows are designed to provide habitat for the corncrakes that are attracted to the area. Oronsay has an impressive medieval priory dating from the 1350s now ruinous, with cloisters, skulls, bones, grave slabs and Celtic crosses. Eighteen years on since NR3488 : Tombstones at Oronsay Priory. Spot the difference! One of the roofed buildings of Oronsay Priory contains an array of tombstones. 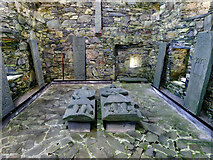 Of the two raised off the floor one is reputed to be that of Sir Alexander Macdonald of Lochalsh, who died about 1498. 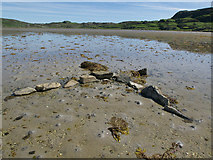 Mesolithic shell mounds on Oronsay are testament to its human occupation around 4000 BC. Cows grazing on an area of shell mounds. Timing your visit to Colonsay at Spring Tides (two days after full moon and new moon) gives you time to explore Oronsay at leisure. At Neaps the tide is often not low enough to give you any time at all on Oronsay after crossing the Strand, but at Springs you can have four hours there around midday. 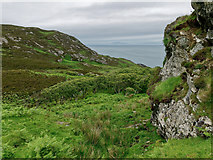 An older standing stone on a prominent hillock and a newer marker at sea level show where the best route for crossing the Strand makes landfall. You should follow local advice, available at Scalascaig Post Office, before crossing. One consequence of the tidal nature of Oronsay is that you will see Oronsay’s extensive white beaches at the best time. After low tide the Strand fills with water and the oysters are happy while those on Oronsay must await the next low water to cross back to the shop or their ferry. Yellow lichens are a feature of Colonsay. For many Colonsay is the island of beautiful beaches, a benign climate and a soft machair that is easy to walk on throughout the year. There is another side to Colonsay. To appreciate Colonsay’s topography to the full, you need to leave the fertile farmed land and take to the interior. There is a minor network of paths created by sheep and wild goats, providing feasible access through heather- and bracken- dominated scenery. Here you find a rugged terrain of cliffs, bluffs and unexpected breaks in ridge lines. 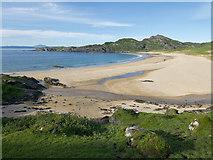 Colonsay is famous for its beaches and machair. Idyllic really. But there is a harder side to the island that few walkers explore. An underlying sharp rock topography covered in bracken and deep heather keeps average walking speeds to less than two miles an hour and unending concentration. Difficult walking through deep bracken and heather compounded by a sharp terrain smothered by the vegetation. On a route to find the standing stone marked on the OS map. 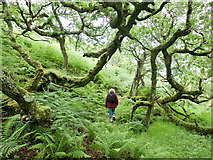 There are also ancient native woodlands that require a real determination to explore. Following a vague path through the upper level of the woodland. The main reward of Colonsay is its coast. From the beautiful bays and exciting cliffs, to the rock-ridged promontories and extensive grazing on the machair. This is the popular Machrins Bay with its large expanse of white sand at low tide. Beinn nan Caorach is the principal hill overlooking the bay. This is the view over Port Mòr from a sheep track leading towards Dun Ghallain. Houses in Lower Kilchatten are visible further up the coast. This coast has more variety than a quick glance at the 1:25,000 map might suggest. Part of the rugged wild west coast of Berneray. I am indebted to Pete Edwards for taking a picture at the identical spot NR3596 : Looking north-east along the Colonsay coast near Druim nam Faoileann to pinpoint my position in the days before I had GPS and even knew about Geograph. A large herd of cattle at peace with the world and unfazed by our attention. Grass for sheep and cliffs for birds. There is golden sand at Kiloran and Balnahard. The incomparable view that explains Kiloran Bay's top listing in Peter Irvine's Scotland the Best. So often imaged for Geograph, yet seen in different light and weather and state of tide one never tires of the thrill of being there. On this occasion it was 7.15 pm on a glorious June evening. Just one person on the beach and barely visible at the wide-angle scale of this photo (equivalent to 24 mm full frame). And it is scarcely different at rush hour! An empty beach - the norm for Balnahard - even on Bank Holidays. There is white sand at Cable Bay and on Oronsay. A quiet bay that is a natural focus for a walk on the south-east coast of Colonsay. A fine place to be in fine weather and at low tide. Because the access to Oronsay is tidal, most view the coastline of Oronsay at the most favourable time for enjoying the beaches. There are old forts above sea cliffs, raised beaches and a coastline peppered with lichens and seaweeds. There is quite a drop from here to the shingle/boulder beach. 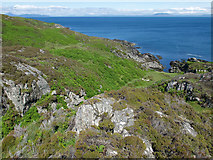 The western cliffs of Colonsay are seen well from here. Two Highland Cattle were feeding here. And always from the coast an outlook towards other islands, the mainland or Ireland. The private grounds of Colonsay House are open on Wednesdays and Fridays in summer when a cafe opens by the house. The gardens contain one of the finest rhododendron collections in Scotland. There has been a swing in the tree for the last 25 years! There is a micro-brewery and distillery near the harbour, next door to The Colonsay Bookshop and publishing house. The island shop, The Colonsay General Store, promotes itself as The Best Wee Shop in the Hebrides. It is well stocked and can provide artisan breads and Saturday and Sunday newspapers on Monday. The Pantry sells the exceptional Colonsay Wildflower Honey - and wild flowers there are in abundance. The Old Waiting Room opens its doors at boat times to attract the car owners, dutifully queueing, with local arts and crafts for sale. With fat balls and fleece these wicker structures are meant to attract birds and provide them with soft nest material. 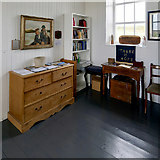 Colonsay has two churches, but all services are held in the Church of Scotland Church, while the Baptist Chapel houses the museum of the Colonsay and Oronsay Heritage Trust. The focal point is "There is Hope". A message displayed in the past from the pulpit. See NR3795 : The earth is the Lord's - there is hope! MV Hebridean Isles, Eileanan Innse Gall, is a ferry of firsts. Not only was she the first of the fleet to be launched side first, she was also the first to be named by royalty when HRH the Duchess of Kent launched her in 1986. Colonsay is covered by the Scottish government’s Road Equivalent Tariff for ferry fares. A car and driver cost £87.30 return from Oban and passengers £14.30 return. An overnight stay in Oban is needed before a Tuesday morning departure when cars must be in the ferry queue by 8.30 am. On other days the Oban departure is in the afternoon. Tuesdays, Wednesdays and Saturdays excepted, the return to Oban is around 9 pm in the evening with implications for onward travel. 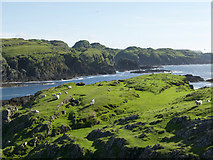 Sheep and grass backed by a rocky coast and cliffs. Visiting over the last 25 years there have been no changes to the exciting topography of coast and hill, no changes to the widths of the road, no change in the peace and quiet. Today access is easier though with a plane supplementing an enhanced ferry service, the estate cottages have been upgraded (not that this was a request from visitors) and with a Backpackers Hostel and B&Bs it is now less expensive to stay a few days rather than take a cottage for a week. So, come for an exploratory visit - a day trip or short let, or splash out with a stylish stay at The Colonsay - and see if you become hooked. Chances are you will add to the statistic of Colonsay being the most revisited island in Scotland. Colonsay and Oronsay and its off-shore islets comprise 85 occupied Grid Squares. 58 Geographers have submitted a total of 1129 images of the area. My contribution is 137 images for 73 Grid Squares. I have now visited every Grid Square on Colonsay with the evidence, with one exception, in scanned transparencies and modern digital images on Geograph. I await favourable tides to complete Oronsay.